This one is all about the words and silly joke: " I can see right through you." As soon as I saw that eye wood button, I knew that this would be make for a cute card sentiment. I may be spending too much time surrounded by 10-year-old boys. 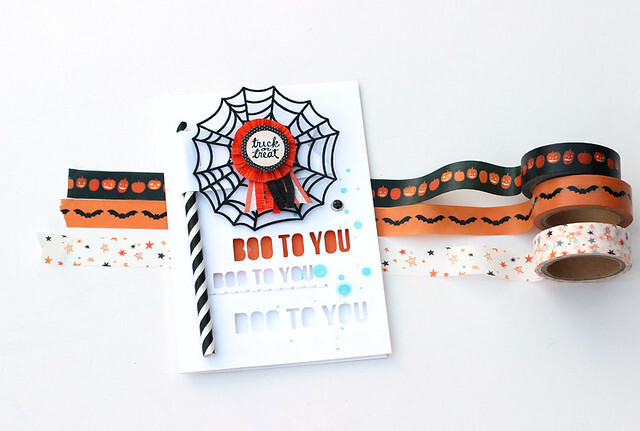 I used a black and white straw here as a fake binding for the card. I like the punch of pattern and texture it added. 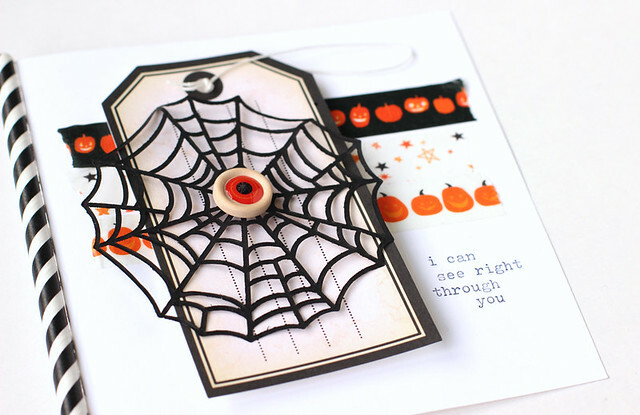 This card is based on a glittery spiderweb and some fringe. The fringe reminded me of spider legs and adds a whimsical fun touch to the design. The last card has a cut out title and a fun flag. 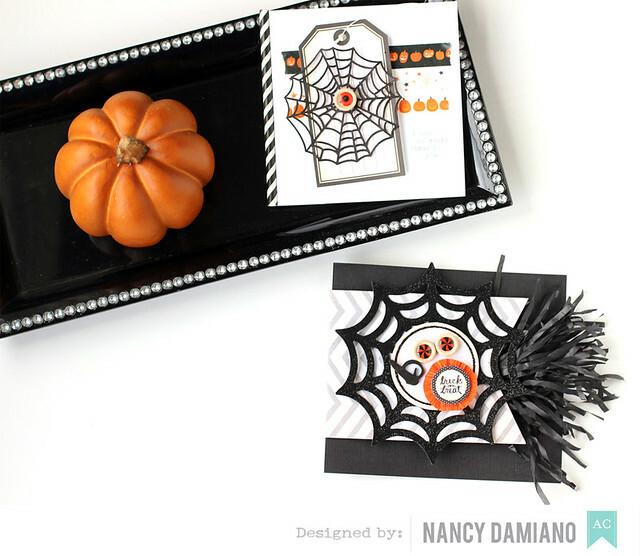 I used a black and white party straw from the American Crafts Halloween line to create this spiderweb embellishments. 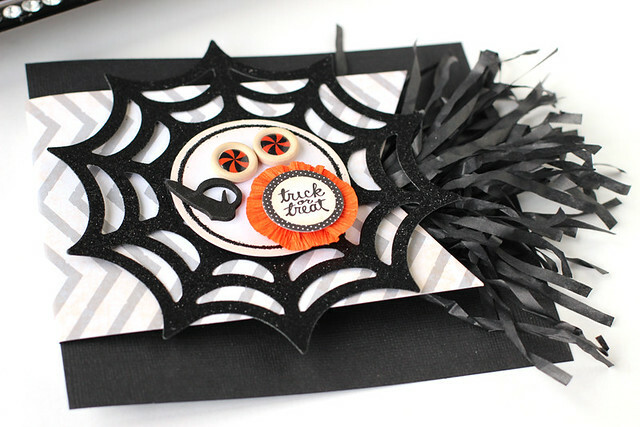 A layered embellishment in the center and some fun splatters of paint make for a card that spooky cute. I've been on a stitching kick this month. I keep reaching for these Amy Tangerine alpha templates over and over. I've had them for a while, but it's just recently that I've come to really love them. So when you're challenged with a line that contains no paper, but lots of beautiful little embellishments, you stitch! For the base of the page I started with a few rows of washi tape sandwiched in between a stitched title and a swish of lime green watercolor. The vertical row of wooden buttons breaks up all of those horizontal lines and gives the photo a little pop. Sticking with the traditional colors of Halloween (and in the photo) makes for a bold, colorful statement. 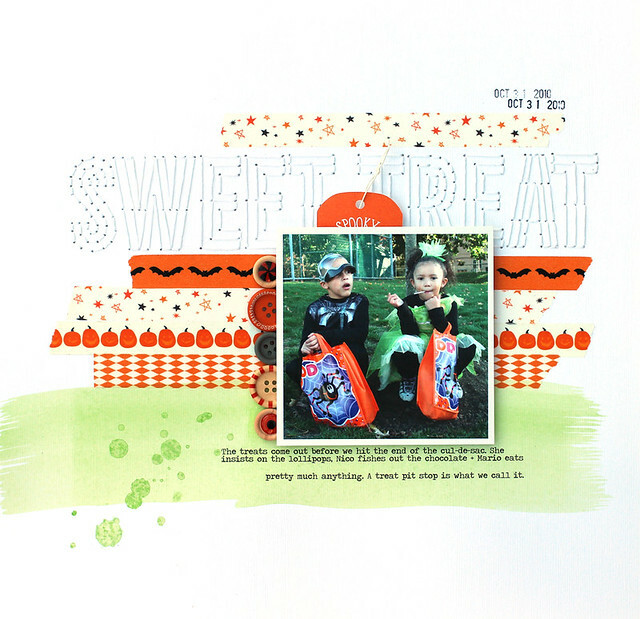 I love this title and the capture of when these littles were so little we had to stop for a sweet treat while trick-or-treating. We are gearing up for one of our favorite holidays around here. Getting the house decked out in all it's ghoulish glory. The spookier the better Nico says. I remember when our decorations were cute, and so were the costumes. These photos are from that time. This was the year that Nico was an astronaut - my favorite costume ever! 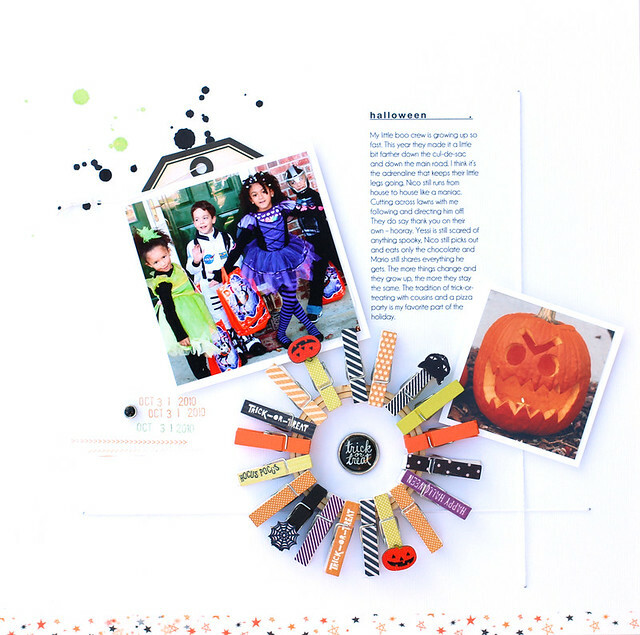 I made this layout for American Crafts and I was challenged to use just the things in their Halloween line - which included no paper! I love a challenge. So I went with these clothespins. I thought they were so cute and would make a fun wreath to hang photos off of. So this design came to be. A little washi tape and some string frame it all in and the photos just pop! My favorite kind of design is one that has that little bit something different. I definitely have a clean, linear style but I like change, and especially in design. Here, the string arrow takes center stage. It divides the page in half. 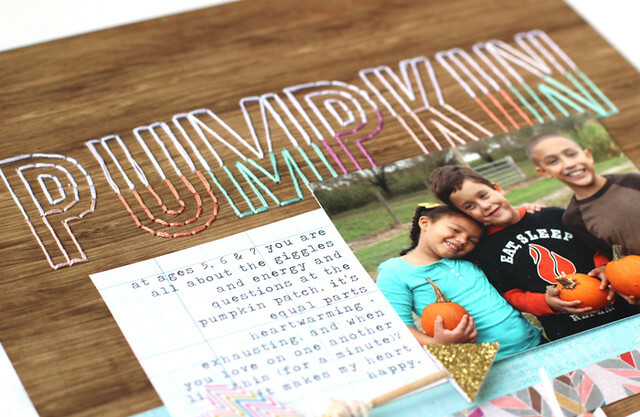 The top is all about the photo and embellishments while the bottom contains a large golden title. Something else that's really different here is the lack of journaling. I think that's a first for me. One that I probably won't repeat very much, because I like words and stories way too much. I know great designers who are able to tell their stories without words, but that is so not me. The colors came from the October Hip Kit. It's all about aqua, coral, woodgrain and gold. It was a beautiful starting point! I've been digging into my fall photo stash and this is one of my favorites. One of those rare moments when the kids were getting along perfectly and Yessi was actually loving on Nico. Now that's akin to actually seeing The Great Pumpkin. 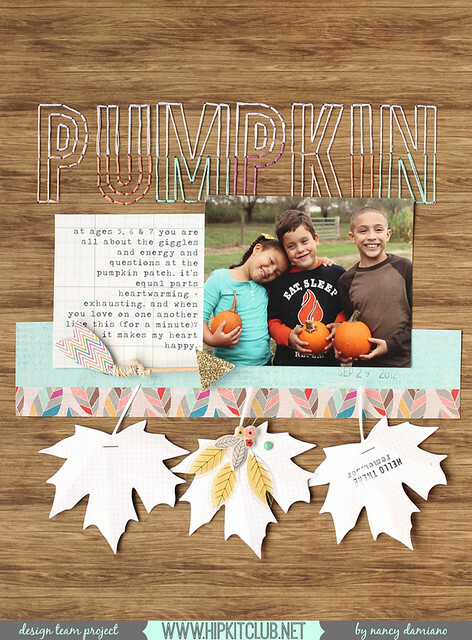 The October Hip Kit Club kit has a light Fall theme to it, just enough to highlight the season's photo but still so versatile. That's my kind of kit. 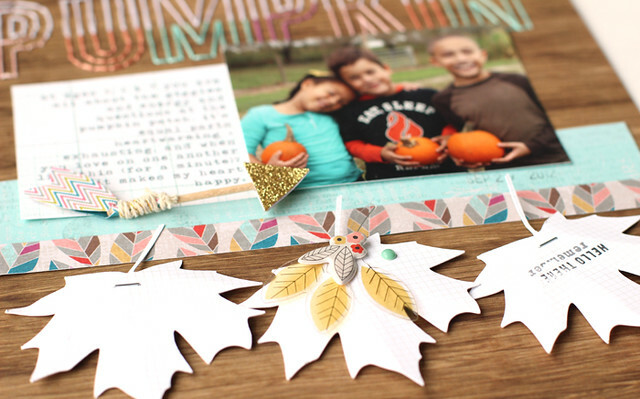 I based this layout on woodgrain for the fall feel and to mix things up a little bit. I've been doing so many white based layouts lately. The dip dyed letter look is my something different. 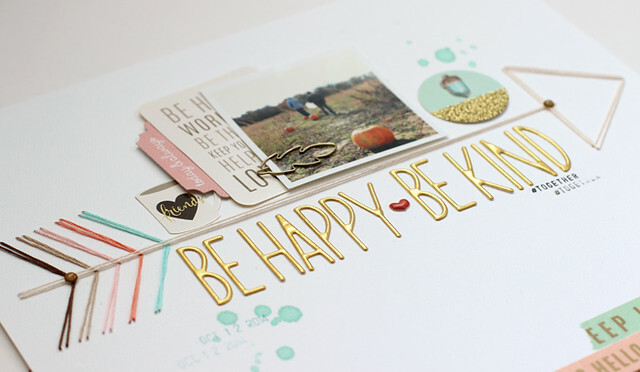 Using the Amy Tangerine alphabet stencil is the key here. She's done all of the measuring and spacing work! One of those beautiful little arrows from Pink Paislee's Cedar Lane underlines the words. And a neat little row of leaf die cuts that have been folded for texture complete the design and balance out the heavy title. 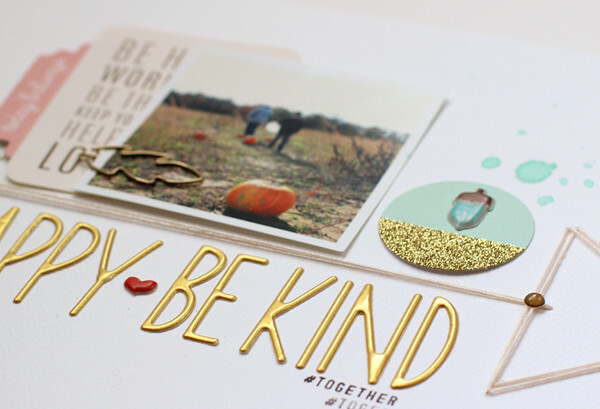 I'm over on the American Crafts blog today with an intro post. Come by for a how-to on this page plus some random facts about me and what I love about designing. Feeling seriously grateful for being included on this team (with Jen Chapin, Gina Lideros and Evelyn Pratiwi Yusuf). 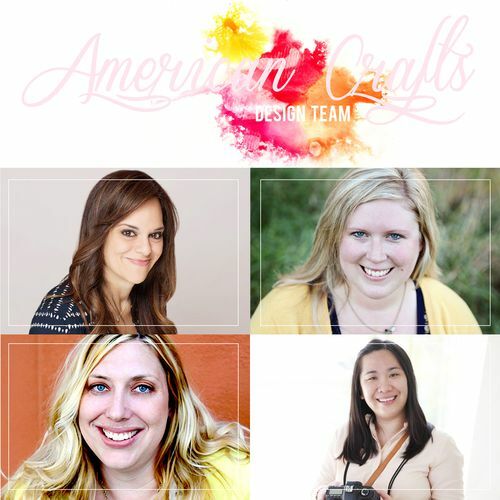 I love the designs that American Crafts brings to market and I'm so excited to part of the experience. This one was a huge surprise for me! I've never had a goal to make this specific team or that one. I think that type of goal setting can be a great motivator and a good thing. But for me, any type of competition kills the spark of creativity. So I've learned to just make things that excite me whether they receive recognition or not. I've had my fair share of teams that I didn't make and complete failures. Not taking that rejection personally is a choice. I learned that making a team is such a subjective thing and not the best way to seek validation. Doing your absolute best work is the validation. Success or failure, it always comes back to what I really love - telling a good story. Even if I'm the only one listening. So this happened. 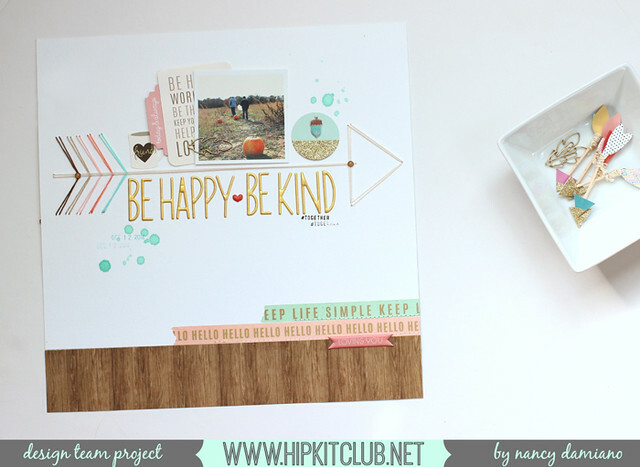 I'm really excited to get started with the Hip Kit Club team! The kits are beautiful and packed with goodness. You can check out the October kit I'll be working with here. This is the first of many changes I'm planning to make this year. Sometimes it's hard taking a leap, but I think I need this to grow and stretch. Here's to new beginnings and Hip Kit!